Before resorting to any type of medication, it's best to try good sleep hygiene for more restful sleep. These drugs are the most commonly prescribed insomnia medication. Think of the words "sedative" and 'tranquilizer" for this category of drugs. They include drugs like Restoril, Dalmane, Halcion and Doral. While, they do induce drowsiness they are also very addictive. You've probably seen TV ads for these sleep drugs - Ambien, Sonata or Lunesta. Elavil, Sinequan, and Desyrel are anti-depressants that have a sedating affect. Rozerem is a drug that attaches to the brains melatonin receptor sights to induce sleep - much like melatonin. Often is used for those who have problems setting their circadian rhythm. Be aware if you are taking a prescription insomnia medication, it is important to talk to your doctor about how to discontinue it. Because the brain has temporarily "lost it's ability" to fall asleep on it's own due to the prescriptions, a person often experiences rebound insomnia. Often the first thing a sleep deprived person will try, is a non prescription sleep aid. I know. 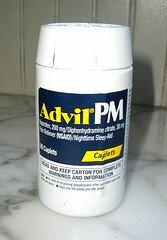 After several sleepless nights, I found myself standing in the drug store reading all of the labels on over the counter - OTC sleep aids. Unable to decide which one to try, I bought several of them hoping that one of these sleep aids would give me a restful night of sleep. While these medications often can be helpful for short periods of stress, they are not meant to be taken long term. 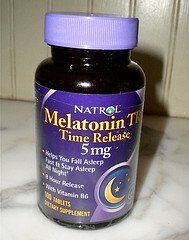 Many sleepless people reach for melatonin sleep aids. The body naturally produces this hormone in response to darkness or to dim light. That's why shift workers who are driving home at 7:00 AM after working all night find it difficult to fall asleep, even though they are dead tired. Melatonin levels peak in the middle of the night and are almost non-existent by mid-morning. Light at night influences the production of this "sleep hormone" that is so important for the regulation of our sleep wake cycle. Insomnia medications may offer a short term solution to temporary sleep problems. However, one needs to be fully aware of their short-term and long-term side effects. Starting or discontinuing prescription or over-the-counter meds needs to be discussed with your primary care physician.